This monster appears in the artwork of Barrage Blast and its cannons appear in the artwork of Number 27: Dreadnought Dreadnoid. This card takes its name from the Dora, an 80 cm railway gun developed and deployed by the German army during the Second World War. Dora is the second such gun of its kind, after the Schwerer Gustav, from which Superdreadnought Rail Cannon Gustav Max derives its name. This connection is furthered by the fact that both cards have the same exact naming pattern, with their names containing Superdreadnought Rail Cannon. This card's design, Rank, Type and Attribute fit those of Anna Kaboom's signature monsters. 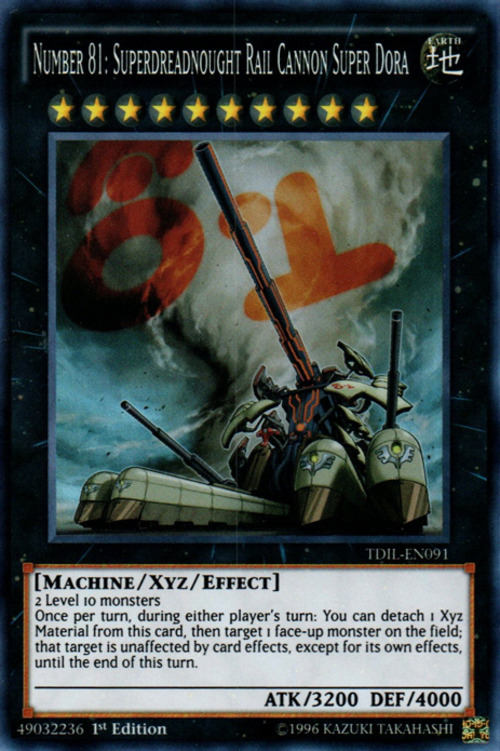 This monster has the longest pronounceable name in the English TCG, being 16 syllables long.